1/24/2007 – She is a French journalist who writes lead stories for Le Figaro and other newspapers. Two years ago she did an interview with chess world champion Vladimir Kramnik, and later the two started dating. On December 31st they married in Paris. 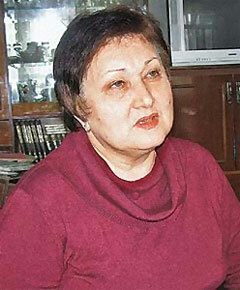 It was a private ceremony, but Vladimir's mother Irina Fedorovna has released details to a Russian magazine. Summary and links. The magazine Komsomolskaya Pravda has published pictures and some details of the marriage between Vladimir Kramnik and the French journalist Marie-Laure Germon. The civil ceremony took place on December 31, 2006, after which the couple went on a six-day skiing holiday in Switzerland (after which the World Champion proceeded to Wijk aan Zee for his next big chess tournament). The marriage was a private affair, but Kramnik's mother released some details to the Russian magazine, which also got hold of some pictures. In the article Irina Fedorovna, who is a music teacher, says that Volodya (Vladimir) and Marie-Laure first met two years ago in France, when she asked him for an interview. Afterwards he gave her a call. Last year Vladimir invited his mother to come over and meet Marie. Irina Fedorovna, who is from Ukraine, took a rushnik – a special embroidered towel – which it is customary to present to a daughter-in-law. But Vladimir said: "It is too early, it is not common in the West countries, people should date for about two years, to get to know each other better". 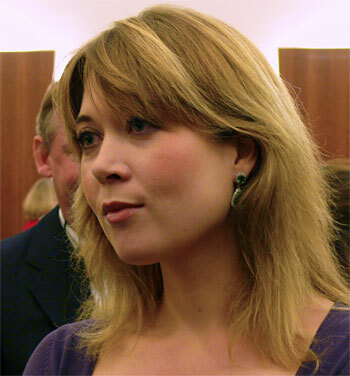 Vladimir's mother says that Marie is a very easy-going, cheerful person, who will sometimes break into song. She describes how they conversed, using a dictionary or simply gesticulating. Sometimes she couldn't understand what Marie said, and the two promised each other that they would learn a little of their languages: Marie Russian and Irina French. 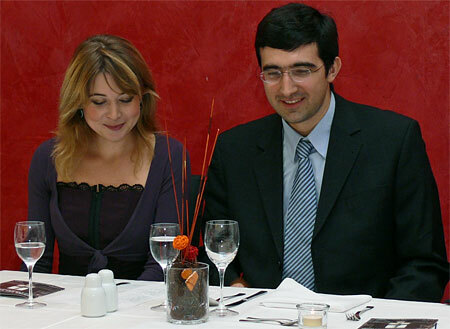 The wedding took place in a close family circle, in Kramnik's appartement in the centre of Paris. Accompanied by about 40 relatives and close friends the couple proceeded to the registration office where the civil ceremony was performed. After that they walked back to the appartement. There a wedding cake awaited them, baked in the form of a chessboard, with chocolate pieces. The position on the cake was the final position of his match in Elista, after which he became the unified world champion. The couple plan to live in Paris, where Vladimir has a spacious apartment (close to the Opera). Marie said she wanted many children – a minimum of three. There will be a separate wedding in the Church of Alexander Nevski in Paris as well, in early February. Kramnik's father, Boris Petrovich, who is a sculptor, could not attend the wedding because of a severe illness, but he sent a silver elephant decorated with precious stones. 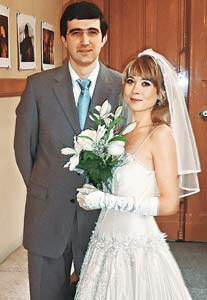 Kramnik's brother Evgeny presented the couple with a leather-bound book on Russian history. They also looked for a fine Cognac that had been made in 1975, the year of Vladimir's birth. In the article Vladimir's mother tells about his childhood, how he loved elephants and bears, how he was modest and retiring, always devoted to chess, which took his attention from everything else. In fact they feared that he may not get married. The article also tells us about Kramnik's youth, how he played chess by telephone in his home town, where he was soon beating all the "grey-haired old men" and was soon considered a wonder-child. Volodya's father gave up his work as an artist to accompany his son to tournaments. It was a tough time for the family. 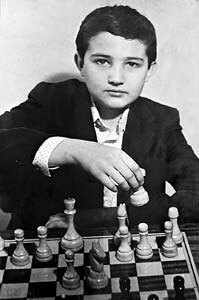 But the boy was immensely talented: at fifteen he was playing blindfold chess on twenty boards, but was also able to read War and Peace in two days. Volodya, says his mother, is hard-working, and a night person, who only goes to sleep in the early hours of the morning. It is not a healthy lifestyle and allows fatigue to accumulate. Irina also speaks about the match and its accompanying scandals in Elista, about the pressure her son was under, about the rematch challenge issued by Topalov and the current tournament in Wijk aan Zee. It is worth reading, if you are able to understand Russian. Original article in "Komsomolskaya Pravda"
Below are a few articles we found in English. If you are able to read French you can find plenty more by googling for Marie-Laure Germon. Go through them – you'll discover that she's the smart one. Zbigniew Brzezinski: "The Neo-Conservative Formula Doesn’t Work"
Élisabeth Badinter: "The Shipwreck of American Feminism"